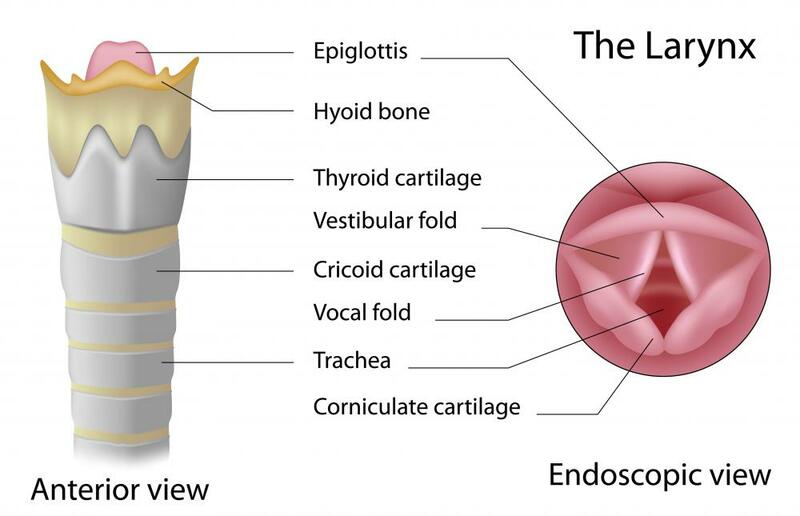 A bronchoscope is used to examine the trachea and larynx. 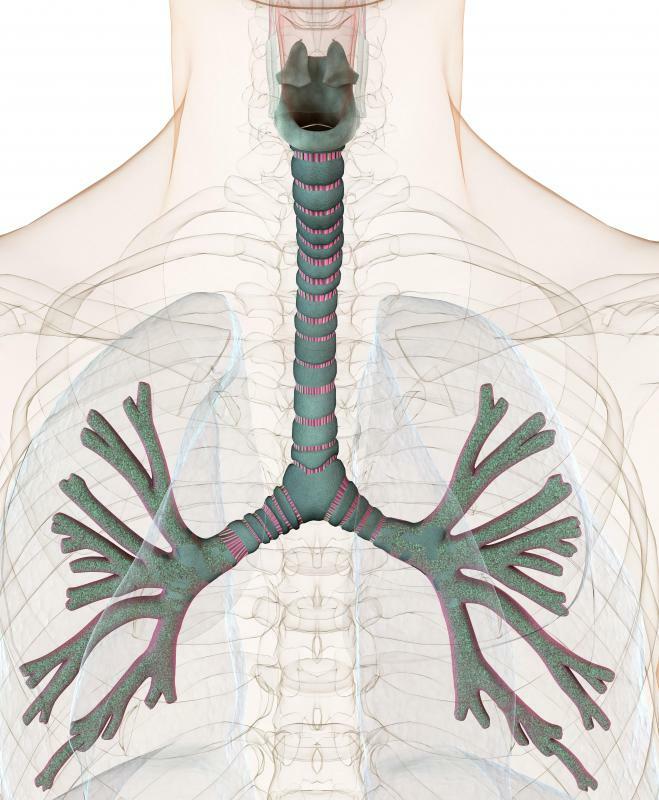 The trachea and bronchi allow air to enter the lungs for breathing. A bronchoscope is an instrument used during a medical procedure called a bronchoscopy to look at the throat, the trachea, the larynx, the vocal chords, and the airway that proceeds to the lungs. In most cases, a bronchoscopy is a procedure performed under at least conscious sedation, so that the patient’s throat is relaxed and the person does not gag on the scope. There are two types of bronchoscopes used, and the one the pulmonologist uses tends to depend upon the reason for the bronchoscopy. Choice affects whether a bronchoscopy will be performed under conscious sedation or general anesthesia. The first type of bronchoscope is called a flexible bronchoscope. It is a long tube with a light on the end, and a camera. The camera takes real time pictures of the airway, which are usually recorded, so that any problems or obstructions may be noted. This type of scope can remove small tissue samples from the airway if polyps are found, or any growths are present. Bronchoscopies performed with the flexible bronchoscope are usually done under conscious sedation, where you are not quite awake, and will probably not remember most of the procedure. When a pulmonologist suspects that there is bleeding in the airway, masses obstructing the airway, or that he might have to take a larger tissue sample, he will likely use a rigid bronchoscope. Since this is not a flexible rod, a bronchoscopy with a rigid scope is almost always performed while the patient is under general anesthesia. The rigid scope is especially required if bleeding is suspected since the flexible scope may not be able to visualize and record the airway very well under these conditions. A rigid scope can also be used in cases of choking. A person who has their airway obstructed with a piece of food might have a rigid bronchoscopy since the scope has the ability to remove the food. Like the flexible scope, it has a light at the end inserted into mouth and airway, and is hooked up to a camera so the doctor can see the airway and find any existing problems. If you are having a bronchoscopy, you should check with your doctor about any medications you take that might create problems during the test. In general, it’s most important to let the doctor know if you are taking any type of blood thinners. You can expect the throat to feel slightly to very sore after the test. This feeling usually goes away within a few hours after waking. Most people go home the same day after a bronchoscopy is performed, regardless of what type of bronchoscope is used. Of course, this depends upon the condition for which the bronchoscopy is performed. Occasionally, people will need to spend a night or more in the hospital recovering from a bronchoscopy if large amounts of tissue were removed with a rigid scope. What Is a Flexible Bronchoscopy? What Is a Virtual Bronchoscopy? What Is a Bronchoscopy with Biopsy? What Is the Typical Bronchoscopy Procedure? How do I Become a Pulmonologist?